The Genius 9000 is the newer and technically the better of these 2 brushes— it’s the brush we rate as the best from Oral-B. It also looks a bit smarter, with a premium travel case and pushes the brushing technology to the next level. However, the Smart Series 6500 still represents a good buy. It might not be the very newest model, but if you still want a feature rich, strong performing toothbrush, then the 6500 is by no means a bad buy, generally speaking. Prices are always changing, but we would not suggest spending more than £65 on the 6500 now. The Genius 9000 has up to 12 days battery life compared to the 10 days of the Smart Series 6500. The Genius 9000 is slimmer than the 6500. The Genius 9000 has a SmartRing whereas the 6500 does not. The Genius 9000 offers more brush head movements/power than the 6500. The Genius has a premium travel case and charger compared to the basic one of the 6500. The Genius 9000 has a smartphone holder included. The Genius 9000 has position detection technology. The Smart Series 6500 has a Smart Wireless Guide/Timer that the 9000 does not. Detailed Comparison: What’s the difference between the Oral-B Smart Series 6500 and Genius 9000? Before we get into the real detail of these differences, let’s just clear up one thing. Oral-B has gone through a bit of a renaming/rebranding phase. The Smart Series 6500 to which we refer may also be known as the Pro 6500 Black. It is the same brush. Pro and Smart Series were sort of used interchangeably but as more brushes have been launched with Bluetooth built in, the ‘Smart Series’ has become more prevalent and the Pro range is now associated to mid range models that do not have the Bluetooth functionality. Thus, Pro 6500 or Smart Series 6500, they are essentially the same thing. The mention of black, well that is the colour! So, now for some more detail. 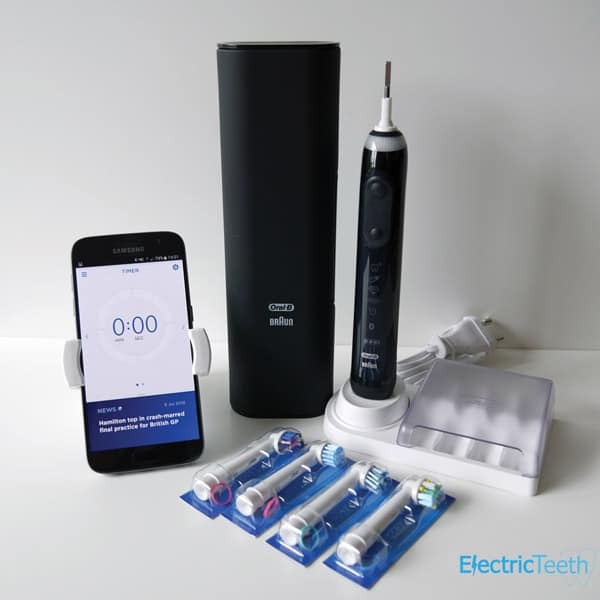 The Genius 9000 is the first brush in the Oral-B range to take advantage of Lithium-ion batteries, a more advanced battery technology compared to the Nickel Metal Hydride. Lithium batteries do not age like Nickel Metal Hydride do so in theory last longer and will also give better battery life due to the technology used. These lithium-ion batteries have been used for many years in Philips Sonicare electric toothbrushes and can last up to 3 weeks. It is also the same technology that is used in the battery for your smartphone. Oral-B has managed a 2 day improvement by making the switch, which is good, but ultimately not good enough, when even a basic Philips brush, a fraction of the cost of the Genius 9000 can last half as much time again. Such a change leads nicely onto the next key difference which is the size of the brush. The 9000 has a cylindrical design and is smaller in the hand than the 6500. Much of this is as a result of the battery but improvement in the overall design and construction process. The consistent rounded feel of the 9000 is comfortable in the hand, although the Pro 6500 does have a reassuring chunkiness to it. This is how the two stack up on paper. Alongside the physical size difference, the materials on the Genius are more premium to the touch. A mix of rubber and gloss plastics. The 9000 is most widely available in white but can also be found in black silver, rose gold and orchid purple, whereas the 6500 is black colour only. The 6500 does boast a few silver accents to the side of the brush handle, but personally, I prefer the all black or all white design of the Genius. With both black coloured brushes, comes a white coloured brush head. Black coloured brush heads are just becoming available on the market. Another noteworthy point is that the Genius 9000 has 5 of the available 6 cleaning modes marked on the front panel of the brush handle. The relevant mode illuminates when selected (with the exception of the standard daily clean mode). This function is not available on the 6500. It does show the cleaning mode on the Smart Wireless Guide though. Not exactly a necessary feature, but one that allows for a little personalisation and makes the Genius feel a little ‘cooler’ is the LED SmartRing. Essentially it is a ring of LED’s that sit at the top of the brush handle, just below the connection to the brush head that can illuminate one of 12 colours at any one time. When the brush is running the SmartRing lights up and can be changed from the Oral-B smartphone application. This same smart ring will flash at 30 second intervals to tell you to change quadrant, whilst also illuminating red when the pressure sensor is activated. The 6500 does have a pressure sensor on the back of the brush handle that will illuminate red, but the design of the Genius 9000 SmartRing does make it slightly more obvious. The 6500 LED does not remain on, nor can the colour be changed. It does have a green LED which will also flash on the 6500 when it is time to change quadrant. Serving no real purpose other than perhaps a little more visibility for pressure sensor activation, the SmartRing is more of a design statement in my opinion. For the real connoisseurs who want the very best in brushing technology, it can be argued that the Genius 9000 wins. Offering up to 10,500 oscillations and 48,000 pulsations compared to the 8000 and 40,000 of the 6500, the Genius 9000 is scientifically better. The reality is much harder to tell. Both do a fantastic job of cleaning your teeth and really you should not focus on this difference too much. The biggest thing that you can do to actually notice a difference is to ensure your routine and technique is spot on. Making sure you brush twice a day in the right way will be a bigger improvement than simply a bit more movement in the brush head. There comes a time when many of us need to travel, be that for 1 night, 1 week, 1 month or even longer. Well, the good news is that both models here have you covered as both are supplied with a travel case. However, the Genius 900 has a premium travel case which goes a little further and can do a little more for you. Both protect the brush handle and up to 2 brush heads, but the 6500 has a basic plastic case which is clear, whilst the 9000 has a white or black premium travel case. This premium solution is stronger and smarter looking, finished in a soft touch coating compared to the clear plastic finish of the 6500 case. In addition, the brush can be charged in the case that comes with the 9000 by connecting the supplied 2 pin mains charger to it. A green LED will illuminate when it is charging. On from this, there is also a USB port on the case, into which you can connect a USB power cable for your smartphone. Therefore from one wall socket, you can charge your toothbrush and your smartphone. Inside the case is a small clip that can hold your smartphone in an upright position, to allow you to view the Oral-B app when using the brush. A very neat solution all told. This means that when travelling with the Genius 9000 you are able to take the travel case and the charger for the travel case whereas with the 6500 you take the travel case but you also need to take the charging stand. 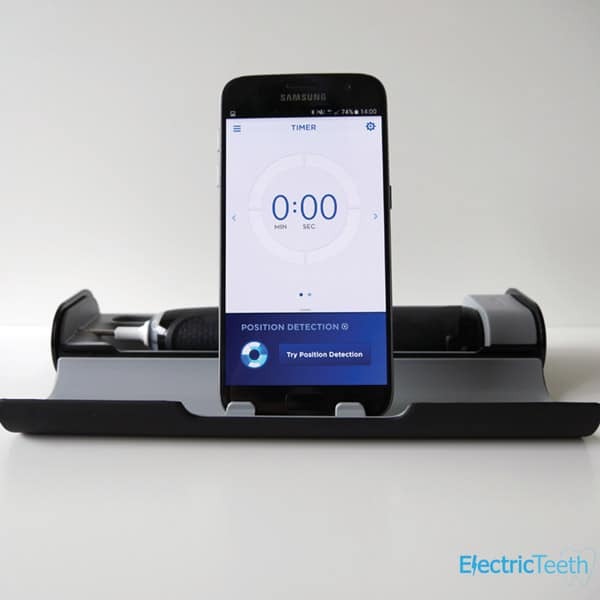 Another difference between these two toothbrushes is that in the box with the Genius 9000 is a white coloured smartphone holder with suction cup that is designed to be mounted to a mirror or tiled wall. 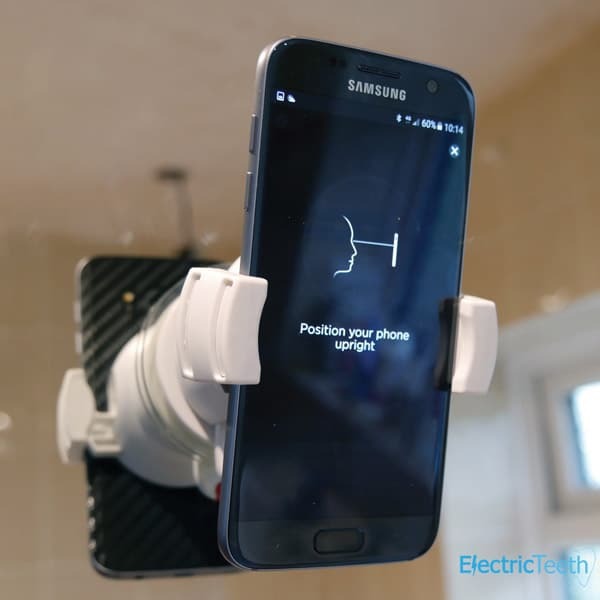 This holds your smartphone in an upright position so that the front facing camera on the phone can be used to track you clean. You have to mount your phone in the smartphone holder each time, start the app and begin the motion tracking/position detection. The camera and holder must be in line with your head to work. Once active, the camera and sensors in the brush track movements and guide and educate on better techniques and timing for cleaning your teeth more thoroughly. 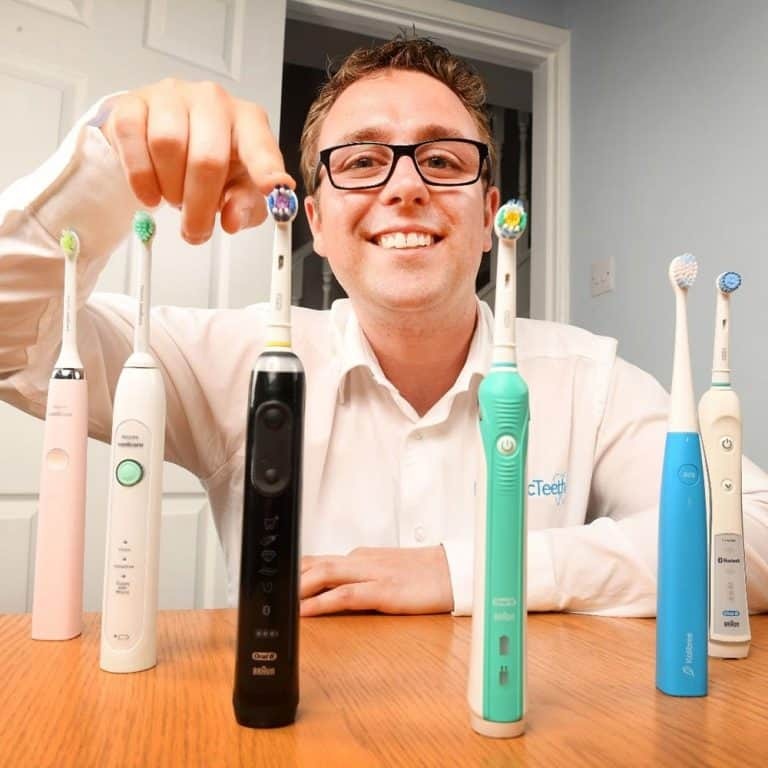 Whilst this is a clever solution to try and help work towards better oral health, the technology it can be a bit clunky, with a phone holder not being something everyone wants in a bathroom and most likely is not something you want to have to take this with you when travelling. The position detection technology is a feature that the 9000 offers as an extension of the Bluetooth connectivity that both brushes have. This connectivity is a step forward and certainly helps from the point of view of diarising your cleans, holding yourself accountable and improving your brushing routine. However, whilst the use of the position tracking and motion tracking is a step in the right direction, it is one that for most, will struggle to justify continuing on a longer term basis for the time and hassle factor. The last final major difference between the two is that the older Pro 6500 comes supplied with a little oval shaped object that is powered by 2 x AA batteries. It looks like a small clock and acts as this when not in use. Known as the Smart Wireless Guide, this connects to the Smart Series 6500 when it has been switched on. This is an excellent little gadget and an omission with the Genius 9000. Although the smartphone app does mostly the same, hence the removal of it. We believe this is a great little unit because it works well to glance at to see how much time you have left, whilst also offering a clock in the bathroom when not in use. It would work particularly well for Genius 9000 users if they are not using the app and need a steer on how well they are doing or how long they need to clean for. But, this is not possible as it is only available with the 6500. With the main differences covered, you should understand how and why the brushes differ. 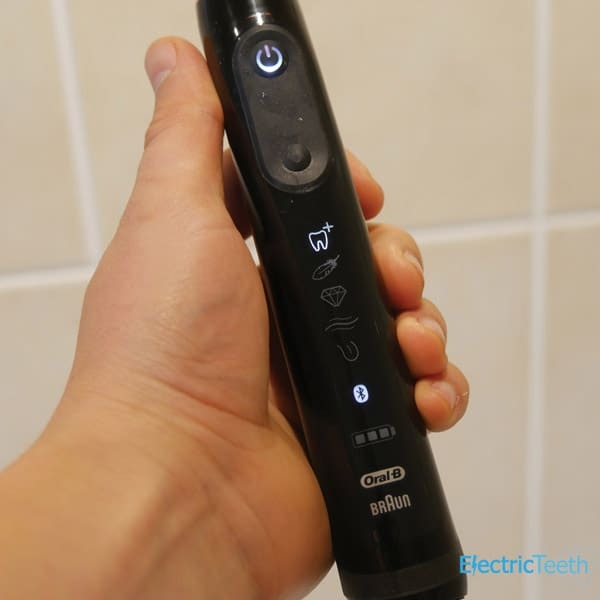 The Genius 9000 is innovative and pushes the electric toothbrush further into the future like the 6500 did when it launched several years ago. Neither are bad, both are very good and offer a lot of features above the more basic models. However, unless you need or want these additional features there are benefits to be gained for opting for cheaper, less feature rich models like the Oral-B Pro 2 2000 for example. It is worth stating quickly how both these brushes are similar in that they both offer 6 cleaning modes, come supplied with 4 brush heads, come with a charging stand, brush head storage tray, 2 minute timer, quadpacer, pressure sensor and a 2 year warranty (which can be extended to 3). Technically, it can be argued that the Genius 9000 cleans the teeth better than the Smart Series 6500. Why? Well, that is because the motor in the Genius 9000 offers up to 10,500 oscillations and 48000 pulsations compared to the 8000 and 40,000 of the 6500. Can you really notice this? The reality is that it is extremely difficult. The 9000 has the motion tracking too, so if used correctly, you can end up with cleaner and healthier teeth than with the 6500 but this is more habit and user training oriented and commands more time if you include setup. Personally, I do believe even a dentist would struggle to suggest one is better than the other and it is not possible to tell which you were cleaning with. The biggest improvement any of us can make to have cleaner and healthier teeth is to ensure we have the right technique and clean for the right amount of time. Both brushes encourage this, the Genius 9000 just has the added advantage of technology that can help train you that little bit quicker. The Genius 9000 does tend to be more expensive at around £150, but it can drop to around £100 at certain times. The 6500 fluctuates in price but anything below £65 is a fair price. Given the 9000 sets the trend for the future, then we would generally suggest opting for the 9000. If you can’t justify this, then there are other options, such as the Smart 5 5000. Ultimately, although the decision is yours, we sway towards the 9000. At £65 or less the 6500 is a pretty decent buy however. But, time it right and the 9000 can be purchased for a competitive price to make for a sweeter deal. If you found this useful, have any thoughts and opinions from going through this choice process yourself or have used either brush and want to comment, please do using the comments section below; what you have to say could be of real benefit to somebody else. Thank you so much for your incredibly comprehensive and informative review – you’ve managed to provide more information than even Oral-B customer support could, which is saying a lot as they’re quite knowledgeable. I would like to know how you test for the efficacy of the brushes and how you came to the conclusion that the difference in number of pulsations is, in reality, negligible. The only way we can test without getting really scientific is by using the brushes and comparing oursleves. It is of course open to personal opinion and feeling and is by no means a strict way to make comparison, but it is the most practical as this is how you would likely test given the opportunity to have each side by side. Add to this our knowledge that brush speed and movement plays only some part in an effective clean. Whilst more movements gives more opportunity for sweeping away bacteria and plaque, the potential difference and benefits are only really highlighted over long periods and making sure you have the right brushing technique will have more beneficial impact.